Many Christmases ago, a stolen kiss beneath a snowy sky sealed their fate. Jonathan Santini is driven by passion and an unrelenting pursuit of two things: A better life through labor law and Isabella Juliana Alfano. But his checkered family history puts Jonathan on the outside of Isabella's Alfano clan. 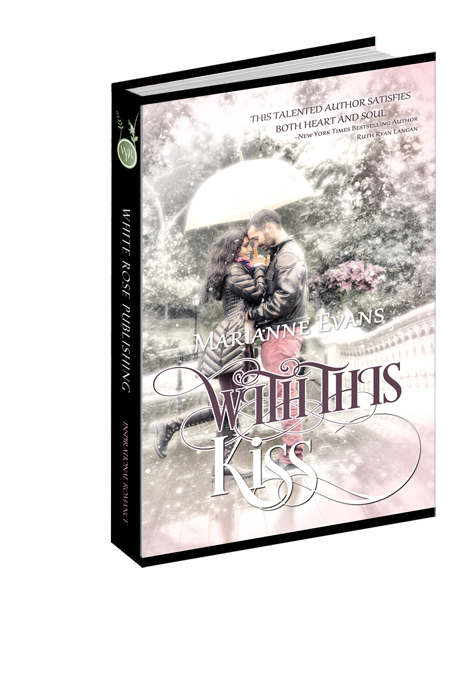 Isabella's tangled emotions can't stop the love she feels for the bad-boy-turned-good. When she takes over her grandma's deli in East Rutherford, New Jersey she and Jonathan are thrown together again, and the chemistry is instant and electric. But the obstacle of family honor isn't the only thing in their way. A jealous colleague at Jonathan's firm is bent on revenge...revenge that puts Isabella's store into legal peril. Will love be enough to see them through? Voices filled the banquet hall. Music and laughter resonated off the walls like the bell chimes of the season. Scoping the room, Jonathan Santini accepted and dismissed people at a glance. He didn’t intend to stay long; he simply wanted to pay his respects to Rachel Alfano—affectionately referred to by those who knew and loved her as Grandma Rache. He’d spend some time with Grandma Rache and then call it a night. Social glitz had never been at the top of his favorites list, and he wasn’t really into mingling with the horde of family who had gathered for Grandma Rache’s eightieth Christmas. Jonathan’s visual wandering took in the long head table festooned with balloons and streamers of green and gold, red and white. His attention zeroed in on a spot to the far side of the room. The solitary word rode a tempting circuit through Jonathan’s mind. A solitary sensation filled his body. Lightning-sizzle. She looked a bit younger than the type to usually hold his interest, but she took his breath away. Olive-hued skin suggested an Italian heritage. He focused on her bare, creamy arms and his fingertips twitched. His gaze traveled the length of a thick column of dark brown hair that fell neatly to her waist and shimmered beneath the overhead lights. A few errant curls tumbled free from a pair of tiny, sparkling barrettes. The image prompted an ache to know more about her. In manner and appearance, she struck him as a young woman of breeding and class, while he felt out of place in this sea of tuxedos, fancy clothes, and sparkly baubles. In fact, the longer he surveyed the scene, the more oppressive became the neatly knotted tie he wore. But he resisted the instinct to run a finger beneath his shirt collar. Instead, he straightened his shoulders and lifted his chin. Settings like this left him edgy and tense. Frankly, he’d rather be in his commissioned post behind the counter of Rachel Alfano’s simple neighborhood grocery store. After all, he thoroughly enjoyed chatting up the slew of customers who relied on Rachel’s Deli for sundry items, fresh sandwiches, and all the latest neighborhood gossip. He loved the store and Rachel Alfano, because Rachel returned that love ten-fold and unconditionally. That was her way. Would the rest of the Alfano family react in similar fashion? Blue collar versus white collar—with complex layers between the two? The answer to that remained to be seen. He moved forward, captured by the pull of the mysterious woman’s large brown eyes. Wide and full, her mouth often fell into smiles as she chatted with a group who stood nearby. By way of contagious reaction, Jonathan smiled as well. He watched her glide from her position at a built-in buffet table to stand close to Rachel’s side. She settled a hand lightly on the older woman’s shoulder—evidently his mystery lady knew Rachel quite well. Tenderness accentuated the gesture; loving emotion telegraphed from her eyes straight through to her mannerisms. That fact intrigued him even more than her beauty. Eager to meet her, Jonathan moved to join their group. When he stepped up, he bent to greet Grandma Rache with a tender kiss on the cheek. Petite and pleasingly rounded, she wore a simple, red, wool dress with pearls at her throat and ears. She looked far younger than her years would tell. When he straightened, he looked right into the eyes of his mystery woman. No longer diluted by distance, her presence hit him swift and hard. The bodice of her dress featured black velvet. Involuntarily his fingertips twitched again, reacting to an inner call to reach out, to touch the soft fabric. She sipped water from a goblet and then set it aside, all smooth grace and supple form. When she moistened her lips, he all but tasted their dewy, sweet flavor. Jonathan took Isabella’s extended hand and kissed the back, admiring her and unapologetic for it. Bella’s attention slid to Jonathan’s left. He turned, following the direction of her gaze. The youngster, maybe six or seven, all but rocketed into her open arms. A look of love bloomed from Bella’s smiling lips to the depths of her eyes. Fleetingly Jonathan envied the boy for being on the receiving end of her tenderness and enthusiasm. Bella crouched and flipped her hair to the side so she could give the kid a peck on the cheek. The back of her gown scooped discreetly just as the front, and once more the sight of her exposed skin turned into a siren call, prompting his fingers to twitch. Resolutely, he quelled the impulse. She looked back at Jonathan, apology in her eyes. He smiled and nodded in understanding. In an instant, her attitude morphed from superior to ice-cold. The transformation left him confused; he’d never met her before. Oh yes, he thought. Here we go. This woman knew his dad, the scrappy, opinionated, tough-minded businessman and former union boss. Jonathan’s struggle to remain proper evaporated once he left. He clenched his jaw and strode toward the bar. Right about now something cold and bracing was definitely in order. Bella watched Jonathan from a distance while her niece, eleven-year-old Christina, kept her company. He stood at the bar, nursing a beverage of some sort. His leather jacket was off now. It probably hung on the coatrack in the entry hall. She turned her attention to her evening bag and searched for lipstick and hand lotion. She and Christina stood beneath an evergreen wreath adorned by a large red bow and glittering, white, twinkle lights that sprayed festive, sparkly beams across her niece’s face. “You always smell so good.” Christy swayed in time to the music that played and pointed at the bottle Bella held out. “Is that what you use?” she asked as she reached towards the bottle. Bella nodded. Trésor. The scent was her favorite. Christina’s hero worship prompted Bella’s smile. She remembered coveting such vanities when she was her niece’s age. Their almost seven year age gap felt like a few decades of maturity. Christy smiled, her delight as bright as a sunbeam. On a dais near the back of the hall, a DJ continued to play pre-dinner music selections. Guests spun on the dance floor. Jonathan looked her way once or twice; Bella ducked her head in diversion. Bella felt a fingertip slide, slow and firm, against the length of her arm. She jumped, knowing who it was without turning around, even before the familiar voice sounded. The lighting toward the back of the banquet facility was dim. Thousands of tiny white lights wound through thick swags of evergreen on the walls. A brightly illuminated tree stood guard in the corner, beneath it a veritable flood of presents. Strobes from a suspended sparkle ball picked up the light and flashed all around Jonathan. As though compelled to focus attention only on him, Isabella noticed each tantalizing play of light and dark. He tucked her expertly into his arms. She looked into his eyes and promptly realized she was out of her league with this mystery man. She lost herself in eyes black as coal. Straight, jet black hair fell in neat layers to the collar of his shirt. Bella imagined the satiny texture of it and felt sure that reality would surpass the fantasy. She allowed him to pull her closer, but skirted eye contact by watching him twine his fingers with hers. His skin, olive-hued like hers, was rougher, arousing. “It’d certainly be my pleasure,” he murmured, almost too low to hear. But Bella caught the words, and heat climbed through her body, instant and bone-melting. Seeming to realize he was busted, Jonathan’s lips curved upward. But the effort left her dizzy. He possessed an aura of confidence she envied. In fact, it pulled her to him at the same time it left her unnerved. Always carefully refined and proper, she absorbed the vibration of his inner strength, wishing she possessed a larger portion of that attribute. He settled their joined hands against his chest and they swayed together in time to the music. They remained part of a crowd, yet at the same time, the moment they shared built into privacy. “I just met your mom,” he said. “And?” She braced herself for what her mom might have said, or how she might’ve reacted to a person who exhibited his degree of intensity and edginess. Large shoulders, tightly muscled, lifted and fell against her splayed hands as he shrugged. “Tell me about it,” she muttered, which only increased his smile. Why on Earth would that be? She pondered the point, but didn’t want this moment tainted by negativity. Instead, she tucked her head against his chest. Jonathan’s breath was warm and soft against her cheek.